Buying a gift for your partner will be a great idea to pacify their aggravated temper. Spend time with them and make sure you forge uncountable memories with them. This week, you are going to get things which will seldom make you feel happy, due to which you’ll have to be content with whatever you get on your plate. You will enjoy your work but make sure you take care of your health. This week would bring in great outcomes in your love life. A trip or an excursion could be planned this week which would put an end to all the confrontations and arguments going on between you and your partner. The beginning of the week looks good; if possible, visit a place that serves sweet delicacies. Your neighbours might pry out information about you from some sources. Their inquisitive nature might make it difficult for you to meet your lover. The weekend will be like a balm to your soul, as things will settle down followed by a tranquil evening. Remedy: Pay homage to the supreme god to fetch positivity in life. A great start to this week is assured for you. Luxuries will make you feel happy and satisfied. Success is assured to all your plans and you will enjoy this time. Singles will enjoy this week in company of their friends whereas the married ones are going to have magical experience in the weekend. You are suggested to drive carefully during this week. Your passion for book reading will get invigorated by the week end. This week is going to go brilliantly well for you in love matters. Your partner will value your opinions and suggestions more in this duration. For all those who’ve been looking for a way to confess their love to their partner, the time is favorable. The week will start on an alluring note. The mid might see you going for a movie with your beloved, howbeit the weekend could give you some anxiety and trepidation. Remedy: Keep your loved ones happy. Each day of this week will bless you with happiness. Financial life of the natives is going to be great this week, although it’s advised that you manage your expenses to avoid any money crunch. The natives might be a little distracted due to their child’s education. Even though this week is favorable for you, you have to ignore alcohol and non-vegetarian food to stay in the pink of your health. This week will produce mixed results for you. A misunderstanding due to any financial issue might lead to arguments between you and your partner. However, this will work flip side for you, as the tiff would bring you two closer. Your feelings would be on an overdrive this week. The start of the week will be merciless, as you won’t be able to meet up with your beloved. Communication would be maintained through telephonic means. The mid of the week will be crackerjack, but the weekend might get problematic for you. Your neighbours might be keeping an eye in this duration, so be cautious. Remedy: Don’t shy away from any toils or hard work to achieve big in life. You might be lured to try meditating during this week to keep yourself healthy. The starting of this week looks quite mundane and you might be distracted due to some domestic issues. Improvement will be seen in your work as the days pass, making you more confident. There are chances that your spouse might complain about you not taking out enough time for them. This week will require you to work harder to achieve the picturesque relationship. Steer clear off stubbornness and arguments. Your ego might make it difficult for you to stay content and satisfied. The beginning of the week will be on a blissful note. You’ll be able to enjoy with your beloved and spend quality time with them. However, you will still be yearning for the warmth of your lover by the end of the week. Don’t dwell too much on your past to avoid any arguments that might sour your mood. Remedy: Be calm in the beginning of this week. You will give your best in everything you do. Favorable results will come in every task you do and you are going to be more serious about your health. Couples will enjoy great time together in the weekend. You will get appreciation for hard work and dedication you have towards your work. Try to control your expenses during this phase, to avoid any financial crunch later on. 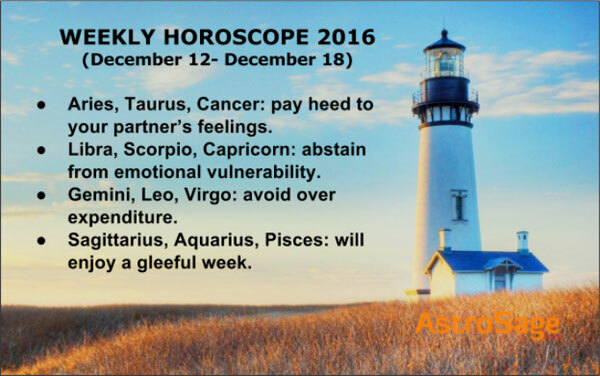 This week looks unfavorable for love affairs. Your health won’t be in it’s glory, which might make you disinterested in meeting your lover. Lethargy might affect you this week. Stay away from the blame game with your partner. Stay loyal and have faith in your relationship. The beginning will be mundane, with the mid of the week sprucing up things for you. The weekend will be the harbinger of mood swings and ego in your behaviour; keep your temper in wraps and act accordingly. Remedy: Don’t spend money unnecessarily. It is important to think before speaking or else you might get into unnecessary tiffs. There are chances that you might meet your ex lover in this week. Your professional life is going to be satisfactory and peaceful. Children might bother you at times, but it’s advised that you keep your temper in check and stress in wraps. You will enjoy online shopping in this week. This week will give you scarce options to meet your partner and spend some much needed time with them. The week will be mixed with both sweet days and infuriating ones. Due to not seeing your partner often, you might get frustrated and seldom throw tantrums, which could sour your relation. Enjoy your every second with them to the fullest, so that you don’t get to complain later on. The weekend will be a breath of fresh air for you as you’ll be able to go on a date with your beloved and make up for all the lost time. Remedy: Pay heed to what you say and when. This week is very promising as your dedication and hard work will get you what you want. You might spend on comfort and luxuries of life. Albeit, your financial life looks great, you need to cease your overspending nature. In the weekend, you might go on a movie date with your beloved which will strengthen your relationship. This week will be bitter-sweet for you. For better prospects, it’s advised that you keep a check on your feelings and emotions. Express your love to your partner, to make them feel loved and appreciated. In the beginning of the week, your feelings for your beloved might go haywire; by mid of the week things will settle down and you’ll feel more relaxed. The weekend promises great times with loved one. Remedy: Be careful while taking financial decisions. Avoid being too emotional during this week as it might stop you from taking right decisions. Emotional vulnerability might make you mushy and indecisive. There are chances that you might get into a hot debate with your father. You are suggested to take care of your vehicles. Maintain a good reputation in front of seniors as they might recommend you for a promotion. This week will yield you mixed results. If you’re in love with your colleague, it’s advised that you stay cautious. Beware of the people at office as they might spread rumours and churn their minds to spin lies. The start of the week will be benign. Married couples will enjoy blissful times with their beloved. The mid of the week urges you to sobriety. The weekend presages better results, as stars will align in your favour. Remedy: Try to share good rapport with seniors. In the beginning of the week, the natives can expect lucrative benefits coming in their kitties. Be it students who want to go abroad for higher studies or working people who want a good job or businessmen, the time is really beneficial for you. People of all vocations can expect great returns this week. There are chances that your relatives might give you a surprise visit. It will be good for you to avoid drinking and driving. You might spend lavishly on religious activities. This week is great for love affairs. People in love will suffer from sleepless nights. The time advises you to keep faith in your love and trust your partner. You might feel as though your partner is not happy being with you in this duration; these thoughts must be kept at bay to avoid stress. The start of the week is favorable; great time for confessing your love. The mid although will be slow, but you can expect that the weekend will make it all fade away, and fill your life with sweet jitters of love. Remedy: Avoid intake of alcohol. You will get the best out of all the hard work you have been doing in the past. The most important thing you have to understand is that hard work forever pays. Businessmen might get financial benefits in this week and plan to invest somewhere. There are chances that your friends might not be available for you at times when you require them. Keep your mood swings in check to avoid lauding people with your tantrums. This week promises to be benign for you. The time is auspicious for marriage proposals. The beginning of the week will be amenable. The natives, who’ve been thinking of confessing their love to their beloved must give it a try this week, as chances of an affirmative response are high. Married couples will be blissfully in love with each other and reminiscence their old moments. The nostalgia of old glory days will bring you together, much closer than you were before. The weekend will be filled with passion and zeal, so despite of a slow mid week you must wait for the better days. Remedy: Don’t depend on your luck completely for anything that you want to achieve. Auspiciousness will prevail in the lives of all the natives. Your suggestions might help others to deal with the situations they face in their lives. There are chances that you will make new contacts while hanging out with friends. Your colleagues and seniors will appreciate your dedication. Creative field might attract you. Your aura will be strong and unbent in this duration, which would keep people from harming your persona. This week is favorable for love relations and affairs, howbeit chances of tiffs are a little high. Give your partner ample time to adjust and open up to you. A meeting could be fixed at a safe spot in the beginning of the week. This place could be anywhere; a place that you can call your safe haven. The mid of the week will lure you to take risks and fall more for your partner, but you must be a little cautious around the weekend to avoid any misunderstandings. Your partner needs your wholehearted support this week, so make sure you endow them with it. Remedy: Don’t let your hard work fall. A good start to this week is assured for all the natives. You might spend money on gadgets; maybe on a phone or a laptop. Professional life will be great this week; students will have full support of their luck. You will earn money or some new business proposal might come. Happiness will come through your family. This week will be humdrum for you. The beginning of the week will be gleeful. You’ll get the chance to go and catch a movie with your lover this week! During the mid of the week, you might get a little secretive which could lead your partner to have second thoughts about you. Open up to them and make sure you keep your honesty and loyalty intact. Steer clear off ego and stubbornness. Your partner might give you plenty of valuable advices this week. Remedy: Strike a balance between your personal and professional life.